Congrats to all runners at the Hampton Court Half this morning – a cold morning but beautiful blue sky- perfect race conditions. 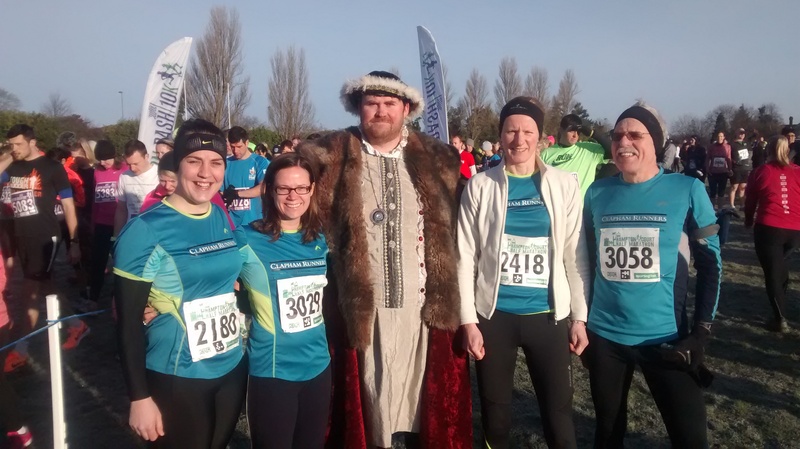 A great course along the Thames, looping round to Kingston and back past Hampton Court Palace to be greeted by none other than Henry VIII himself. Plenty of mud around in the final mile too! Despite nursing various injuries, all our runners did better than expected – chip times are; Rachel & Phil (2.07.32), Frank (2.06.33), Siobhan (2.12.46 PB), Amanda (1.50.59 PB), Ella (2.01.48 – first half in 13 years!). NEWS JUST IN – congratulations to Damian (D2) who ran the Great North West Half Marathon on Feb 22nd also – and finished in an impressive 1.34.20 – holding a 7 minute mile despite gruelling wind and rain along the Blackpool coast, well done!